Given that I am now living in China for a while (Kunming, Yunnan Province), studying Mandarin Chinese, this is the perfect day for a new post. I won’t be able to keep it up, but my faithful readers deserve something fresh. However, you can also go back to last year’s post as well and read about World Vegetarian Day. You guessed it; we will have a vegetarian Chinese dish today. 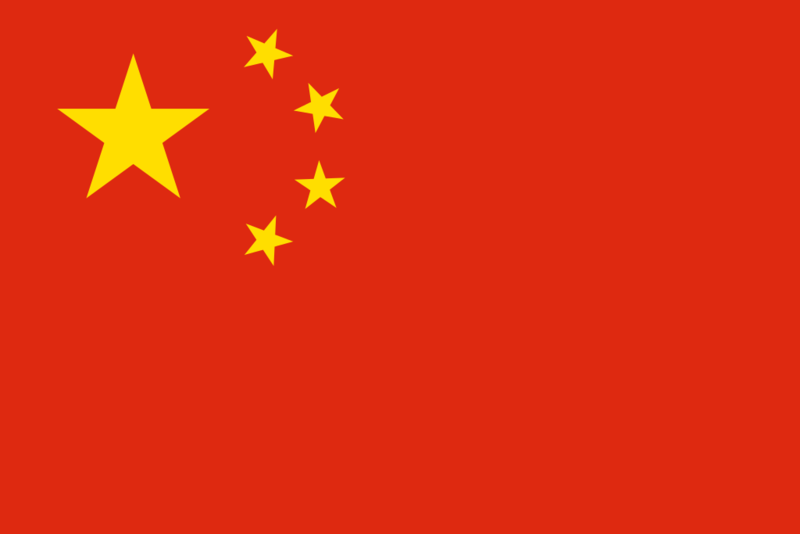 The National Day of the People’s Republic of China is celebrated every year on October 1. It is a public holiday in the People’s Republic of China (PRC). The PRC was founded on October 1, 1949 with a ceremony at Tiananmen Square. The Central People’s Government passed the Resolution on the National Day of the People’s Republic of China on December 2, 1949 and declared that October 1 is the National Day. 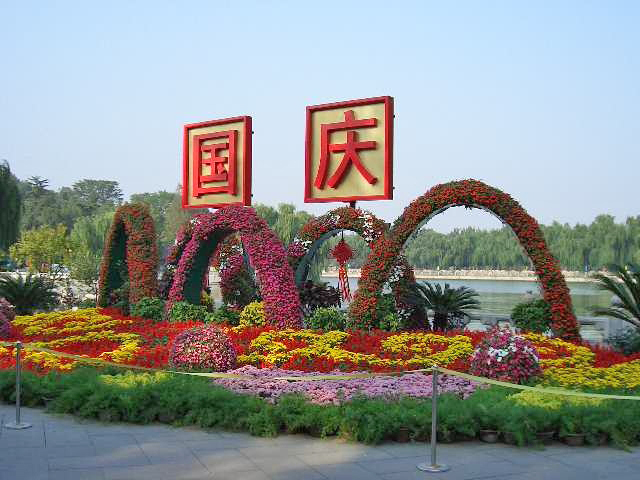 The National Day marks the start of one of the two Golden Weeks in the PRC. A Golden Week is a period of 3 days of paid leave for workers and the surrounding weekends are re-arranged so that workers in Chinese companies always have seven continuous days of holiday. These national holidays were first started by the government for the PRC’s National Day in 1999 and are primarily intended to help expand the domestic tourism market and improve the national standard of living, as well as allowing people to make long-distance family visits. The Golden Weeks are consequently periods of greatly heightened travel activity. I’m very excited to be in the middle of it and especially look forward to the fireworks. The National Day is celebrated throughout mainland China, Hong Kong, and Macau with a variety of government-organized festivities, including fireworks and concerts. Public places, such as Tiananmen Square in Beijing, are decorated in a festive theme. Portraits of revered leaders, such as Mao Zedong, are publicly displayed. Naturally, food plays a big part in the festivities. Until the late 1970’s Chinese food was largely unknown to Westerners except for a few Cantonese dishes that were pallid versions of the originals – and still very common in Chinese restaurants in the West. But, magically, a few regional cuisines, such as Szechuan, began showing up, so that people outside of China could get a glimpse of the immense variety there was to be had. A number of different styles contribute to Chinese cuisine but perhaps the best known and most influential are Cantonese, Shandong, Jiangsu (specifically Huaiyang cuisine) and Szechuan. These styles are distinctive from one another due to factors such as availability of ingredients, climate, geography, history, cooking techniques, and lifestyle. However, it is also important to realize that just as there are French restaurants in Germany, you will find Szechuan restaurants in Beijing. All provinces feature the dishes of the others, but local styles predominate. Given that I am now living in Yunnan, it seems right to focus on that province, especially because the cuisine is little known outside of China. Yunnan is in the extreme southwest of China and borders Vietnam, Laos, and Myanmar. As such it is ethnically diverse, and this fact is reflected in cooking styles. Yunnan cuisine is vastly varied, and it is difficult to make generalizations. Many Yunnan dishes are quite spicy, and mushrooms are featured prominently. Flowers, ferns, algae and insects may also be eaten. 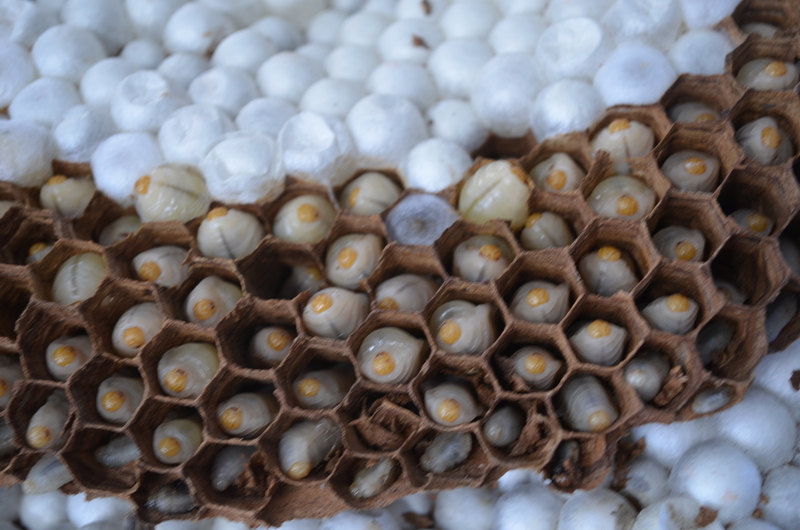 Here’s a little gallery from a recent trip to the local food market in Kunming showing some of the diversity of products, including live bee larvae. Two of the province’s most famous products are the renowned pu-erh tea which was traditionally grown in Ning’er; as well as Xuanwei ham, which is often used to flavor stewed and braised foods in Chinese cuisine and for making the stocks and broths of many Chinese soups. The most famous dish is Guo Qiao Mi Xian or Crossing the Bridge Noodles. (You can find the legend of the origin of the dish and a recipe here: http://www.bookofdaystales.com/beijing-opera/ )The dish is served with a large bowl of boiling hot broth and the soup ingredients separate. The soup ingredients are served on a cutting board or plate and include raw vegetables and lightly cooked meats. Common ingredients include thin slices of ham, chunks of chicken, chicken skin, strips of bean curd sheets, chives, sprouts and rice noodles. Once added into the broth, it cooks quickly with a layer of chicken fat and oil glistening on top. The soup takes a few minutes to cook, and it is then spooned out into small bowls. The noodle used in this and other soups is mi xian. The processing of mi xian in Yunnan is unique, involving a fermentation process. It is made from non-glutinous rice and is typically sold fresh rather than dried. 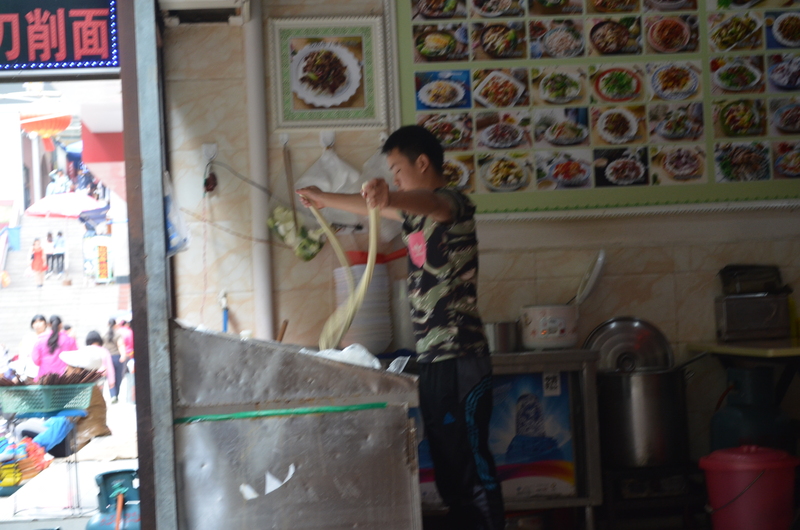 At some street stalls in Kunming you can watch noodle makers at work as I did just yesterday. 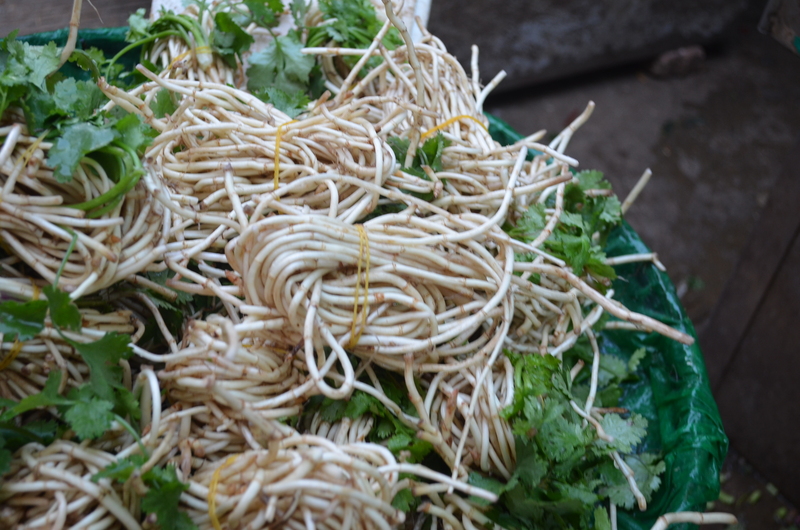 Fresh mi xian smells fragrant, different from other kinds of rice noodle in China and Asia. Mi xian is served in various ways, typically either in broth or stir-fried. When mi xian is served in broth in Yunnan restaurants, it is common for a range of individual condiments to be presented for the customer to add to their bowl themselves. Condiments typically include chile pepper (diced fresh chlle plus at least one or two prepared chile pastes, often mixed with oil), diced fresh chile, cilantro, garlic, pepper (both regular pepper and powdered or whole Szechuan pepper), salt, spring onion, soy sauce, tomato, vinegar and zhe’ergen (a spicy root common to southwestern China). At noodle stands in markets, customers are given bowls and can pick the ingredients they want from a huge array of meats and vegetables. These are then added to boiling broth with noodles. Without doubt, soup noodles in general are my favorite food and Yunnan style is hard to beat. I am really in my element here. Adzuki beans, known locally as hong dou, have been used in Yunnan cooking for millennia. Here is a modified Yunnan recipe for stir fried adzuki beans and mushrooms. 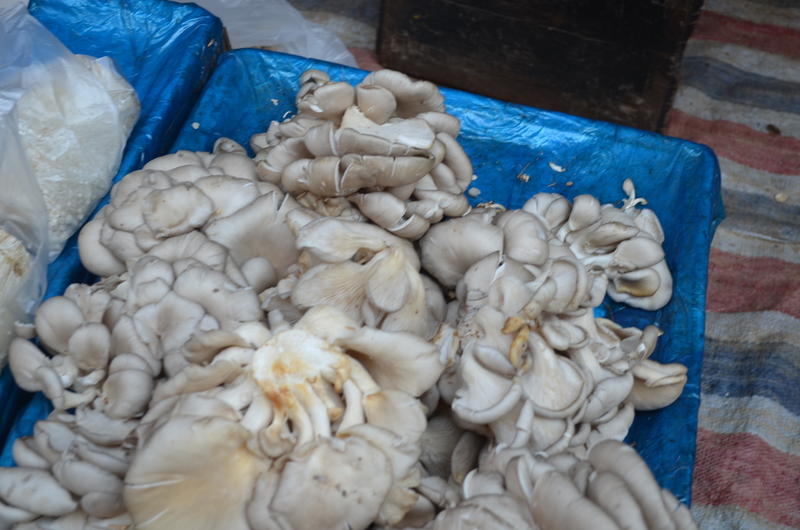 Obviously you cannot get Yunnan mushrooms (he said with a touch of glee) but do the best that you can. 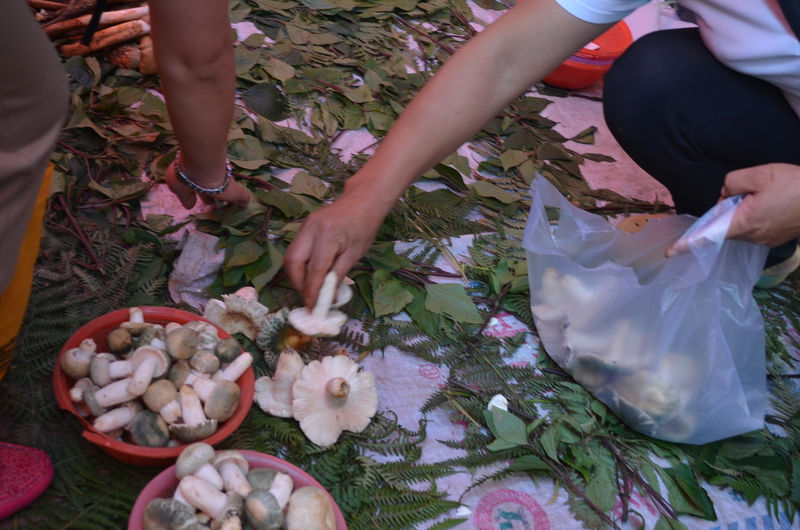 I’ve found that quite often I could get a variety of Chinese mushrooms in barrio chino in Buenos Aires, so I am sure you can find something appropriate if you hunt around Asian markets. Place the pre-soaked beans in a saucepan and cover with several inches of fresh water. Bring to a boil. Reduce heat to low, cover, and simmer for 40 minutes or until the beans are tender and their skins start to separate. My usual test is to pick out a spoonful of beans and blow on them. If the skins split, they are ready. Drain the water off, and then crush some of the beans lightly with the back of a wooden spoon. Set aside. Heat oil in a large wok over a medium high flame. Add the green onions, chiles, garlic, and ginger and stir-fry for 30 seconds. Add the mushrooms and peppers, and stir-fry for two more minutes until the mushrooms and peppers begin to soften. Turn the heat down to medium-low and add the beans. Stir in the soy sauce, sesame oil, Szechuan pepper, and sugar. Simmer until the liquid has reduced enough to make the mixture fairly dry. Transfer to a serving dish.